Small – 1170 square feet for a house has to be in the lowest 10%. My wife’s old townhouse was bigger. 1 bath – I don’t know who buys homes with just one bath nowadays. If you are going to spend 3/4s of a million dollars, you shouldn’t have to fight who gets to use the bathroom when you get home from a long trip. Fixer Upper – It looks like you are going to need to save some significant money for improvements. Perhaps it’s $850K or $900K to live in a nice small bedroom with 1 bath. We rent our place for $1975 a month. It’s a town home as big as this with 1.5 baths. It’s in very nice condition and includes a heated pool and gym. I live in a city that’s pretty similar to Burlingame and fairly close to it. The school system might not be quite as good, but I think it’s not bad by any means. There’s a lot of argument in personal finance space about renting vs. owning. It seems to me that a lot of it depends on your local and the particular property you are looking to buy vs. what you are looking to rent. How much would this home typical list for where you live? Let me know in the comments. A house like that would cost around 500-$850k depending on if it was in marina/seaside CA (low end) or Pacific Grover/Carmel CA (high end). Well, I live in Kansas City, so that would go for probably 125,000 on the MO side, and maybe 135,000 on the KS side. Wow, I live in a very similar home in my area: 1152 Sq Feet, 7500 Sq Ft. Lot, on a mature treed crescent, I wouldn’t call mine a fixer-upper, but it needs cosmetic work. We have 2 baths, but the basement isn’t finished, just the bathroom is done so we use it in emergencies after trips or when the kids ‘just gotta go’. 1150 sq feet is more than enough for a family of 4. Once the kids are teens, ask again, but with a basement I don’t think we will have too much trouble finding space. I paid 102K for mine last April. The roof needed to be redone which was around 6 grand, so at 108K in, I think looking at that ad I got myself a pretty good deal. I can walk to a library, the elementary and middle school, the mall, a grocery store, a convenience store and movie theaters. That’s a $150k house around here! Where I live, a fixer-upper $75K-$85K with a bigger yard. I guess it depends on where you live and comparables in the area. In our area a home of the sq feet would go for maybe 5 years ago 70,000 and today maybe 125,000 – 175,000 which is down from last two years probably 200,000. Wow, seeing things like this really makes me appreciate where we live. A listing like that, as a fixer-upper would maybe go for $80k on that size lot. High 400s in Seattle. If it had been fixed up- $500s easy. Any Seattle people out there disagree with me? It depends on which part of the city/suburbs. A house with a lot like that, in downtown DC – definitely 700K. But impossible to find, so it would most likely be in the suburbs and go for half that. deepali: Yes, in downtown areas a house like that would be more expensive. In NYC, Boston, or San Francisco it would be pricey. Unfortunately houses don’t really exist in those areas, so I’m discounting that fact. This is a house in the suburbs – about 10 miles from any major city – in this case San Francisco. I live around Dallas, maybe 80k if your lucky..
Well, if the house is in the same area code as on the listing, then the $750k isn’t surprising! I live in the 510 area code and our 850sf, 2 (3 at a stretch) BR, 1 bath home would list for $490-550K! And yes it would sell for that even now. We paid $150k 19 years ago. As realtors say, “location, location, location”! If you’re not opposed to buying a townhouse with HOA, you can get one for under $500K with a 2-car garage in the Bay Area . From what I heard on the news, the housing prices in the Bay Area went up by 4% even with the housing downturn. That is ridiculous. I live in Phoenix, AZ and a house like that would probably be no more than $120,000….and that’s pushing it. This home is similar to ours, which we bought in 2004 for $140,000. We could reasonably expect to sell our house now for $160k-$165k (maybe more, but I rather err on the low side). We live just over MD/PA border about 40 miles north of Baltimore. Anything closer to the city or to a highway would cost a lot more. Also, renting a decent townhome/apartment in the suburbs would cost as much (or more) as our current mortgage. Wow. This is why I advocate renting in NorCal even though I’m a part time real estate agent. 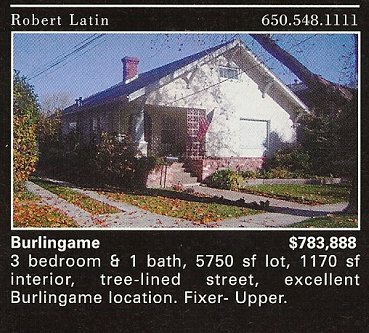 A commission is nice, but that burlingame house is RIDICULOUSLY overpriced and I wouldn’t recommend it to anyone. What justifies that kind of price per square foot? I have a relative in burlingame that loves to show off their $2Mil house, but all I see is money down the drain. I lived in San Francisco all my life, and as much as I love the bay area, these prices don’t make sense at all. I would rent forever if I were to stay in the bay area. However, I decided to leave, which is why I’m getting on a plane to Texas in about 10 hours on a search for my new home. 2800sqft homes for $180K, brand new with a booming job market, now that makes sense. Were I live, that might cost $60-70K. $800K will buy you a nice 3,000 sq ft house in town, a reasonable lake home, and leave probably $100K in your pocket. Or you could buy a nice house and a small apartment complex to rent out. We considered moving to SF several years ago, but prices like this convinced us otherwise. My question is, how realistic is the price for the listing? Just because it is listed at that price doesn’t mean it will sell (in a reasonable timeframe) for that price. In any case, I would venture to guess that a home like that might go for around $120k-$150k in my area. In my neighborhood (about 40 miles from the center of Boston), a house like that would probably cost $150K or so, depending on the condition of the “fixer-upper”. But if it was less than 15 miles outside of Boston… Probably around $300-400K then, maybe even more, depending on the neighborhood. 250K to 300K in move in condition. Subtract 25 to 50k depending on amount of fixing required. In Mountain View, probably about the same price. Real estate in the SF Bay Area tends to be higher the closer one is to the Bay, and Burlingame is an “inner ring” city that touches the Bay. The traditional notion of “city” versus “suburb” isn’t helpful here since there are three “Big Cities” here: San Jose (the biggest city in the SF Bay Area in land area and population), Oakland (about the same size as SF), and SF itself. Also, like LA, there are dozens of smaller cities that have no discernible borders like Mountain View (where I live), Palo Alto, Burlingame, Daly City, Berkeley, Richmond, etc. As for that house, in south San Jose, it probably would be in the mid $500s, and in the Central Valley, probably in the low $300s. It would probably be in the mid $500s in Oakland also. Here, in my part of the midwest, a fixer upper that size…. maybe $50K? I looked at 4 bedroom/3 bath fixers in my area for $75K when we were house hunting. Holy cats! I recently sold a comparable house (but not a fixer) in an area of Colorado where housing prices are still rising for $165,000. It was a great return on my investment … and apparently a real steal for a buyer. Where I live: Montgomery, AL would go for $90,000. But where I work: Troy, AL $50,00 if restored $80,000. Flint, MI. And, more than one. Try the whole damn neighborhood. As is: $225,000. It would rent for around $900/month. I live in NorCal and I’m pretty used to seeing homes with ridiculous prices but this one seems to be waayy over-priced. I bet this house will be in the market for awhile. Since I live pretty much around the corner from Burlingame, a house like that would go for, well, that much. I’d like to buy a condo during the housing downturn, but as you pointed out… the housing downturn hasn’t really helped much in San Mateo county!